Tooltips addon for Styles & Layouts for Gravity Forms plugins lets you easily add tooltips to field labels of Gravity Forms. It comes with multiple options to configure the style of tooltip icon and text. 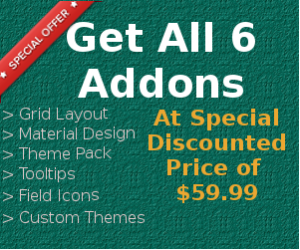 The addon is very intuitive and you can check the below video to get full overview of all its settings. -Added option to create custom theme with background color, font color, font size, border. -Added option to use HTML like links, videos, images in tooltips. -Added option to set tooltips for checkbox and radio inputs.